The Swift Escape 695 is advertised as a six berth Motorhome but with five belted seats is really a five berth. We have added a host of extras to this motorhome giving it a very high specification, Automatic gearbox, Factory fitted comfort pack, special suede / leather feel two tone beige upholstery throughout, Reverse camera, Wi-Fi system, roll out awning, bike rack, upholstery treated with swift shield which is stain resistant. This is a very clever design as it is a low profile model without the bulbous over bed cab, the designers have incorporated a double bed into the roof space above the lounge, which drops down on runners when required, this design apart from being far more fuel efficient, also allows captain style swivel round seats in the cab, therefore giving much more floor space when compared to an over cab bed style motorhome, in our opinion this layout is fantastic for Mum , Dad and two kids or even for 4 adults as the bunk beds are over 6ft long. The Swift Escape 695 lounge has two seating arrangements and can be a large L shaped lounge or two forward facing seats, the large opening sunroof above the cab allows lots of light into the lounge area, TV with built in DVD player coupled to a pop up Ariel with a booster ensures a good TV reception, double glazed windows with cassette blinds and fly screens, pleated window blinds on windscreen, scratch resistant oak effect flooring, comes with a full set of new carpets. The innovative drop down bed in the Swift Escape 695 measures 1.93m x 1.27m , which is 6 ft 4” x 4 ft 2” so is large enough for two adults, and is fitted with a comfortable duvalay mattress, a second larger double is also available when the lounge area is converted this measures, 2.11m x 1.39m , 6 ft 11” x 4 ft 7” . The two rear bunks are also fitted with comfortable duvalay mattresses, and can be separated from the living area by a curtain divider the upper bunk measures, 1.95m x 0.76m , 6 ft 5” x 2 ft 6”, lower bunk measures 1.89 x 0.73, 6 ft 2” x 2 ft 5” , both bunks are fitted with low energy reading lights. L shaped kitchen with everything needed to cook a family meal, 3 burner gas hob, combined oven with a grill, microwave, large 138 litre fridge with freezer compartment allows plenty of space for a family’s needs, ample overhead storage lockers, large cupboard below the sink unit, pull out drawer below the oven, drop down work top extension. 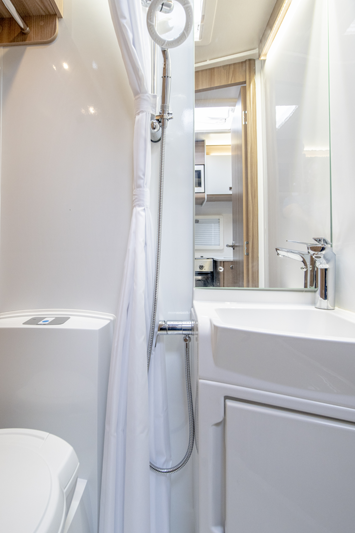 Fully fitted washroom with, Shower cubicle, towel locker, fixed sink unit with vanity mirror and storage, 18 litre cassette electric flush toilet with swivel function, high gloss white wall board, mini downlighters, internal 100 litre fresh water tank, external 60 litre grey waste tank. The Swift Escape 695 is fitted with a fully programable central heating system which blows hot air into selected zones such as the washroom , living area , rear bunks, Hot water is supplied by the combi boiler which is duel fuel, gas or mains electric, overhead locker dimmable low energy ambient lighting, spotlights, LED reading lights in the cab area, Category 6 Thatcham approved tracker system, Easy to use large touch screen interface for controlling the motorhomes functions, including an app to control remotely from an I Phone. Ample electrical and USB ports throughout.